their presence, laughter and warmth. A stoked fireplace amps the camaraderie along with a home thoughtfully decorated with special items. Enjoy our holiday catalog. We hope it gives you a few more reasons to anticipate good cheer this upcoming holiday season. Click on any item within this look book to be taken to a coordinating page on our merchant website - dewoolfsonlinens.com where you can discover other fine bed, bath and table linens and home decor. Did you know, for 35 years and counting, DEWOOLFSON has been meticulously filling and stitching down fillers to create the finest down pillows, comforters and featherbeds? We create the items that truly elevate a bed and a night's sleep from being nice to becoming execptional. From animals to insects and fowl to foe, we carry finger and hand puppets in a variety of sizes and shapes. Available in-store only. natural. comfortable. home. DEWOOLFSON LINENS 9 45 2 N C H i g h w a y 10 5 S . B a n n e r E l k , N C 2 8 6 0 4 U . S . A . © 2 018 DE WO OL F S ON D OW N I N T ’ L ., I NC . Photography courtesy of the respective copyright holders. 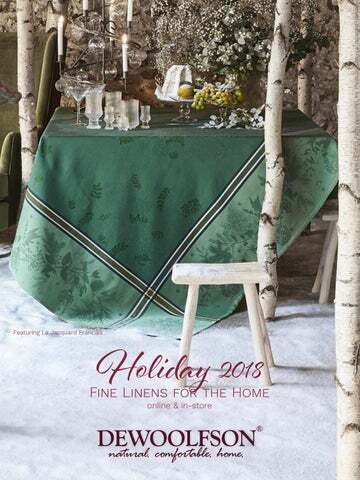 Enjoy our holiday fine linens catalog. We hope it gives you a few more reasons to anticipate good cheer this upcoming holiday season.